According to the National Weather Service, “the Ohio River is going to rise considerably” due to this week’s rains, but is not expected to exceed flood stage as it did in February. On Wednesday, the National Weather Service issued a flood watch for numerous counties and cities in Southern Ohio and northern Kentucky. The flood watch includes Portsmouth and all of Scioto County. According to the weather service website, the watch remains in effect through late tonight. “The Ohio River is going to rise considerably,” said Seth Binau, a meteorologist with the weather service in Wilmington, which serves the Portsmouth area. Notably, however, unlike during the many storms which struck in February, according to Binau and information on the weather service website, the Ohio River is expected to crest at Portsmouth several feet shy of flood stage. On its website, the weather service has the river cresting locally at 45.8 feet about noon on Easter Sunday. Flood stage is 50 feet. Binau said heavy rains through today will affect mostly areas prone to flooding: sewer culverts, small creeks or any poorly draining areas. He added rains are expected to taper off by the end of today, and he predicted a mostly dry Friday. According to Binau, there is no reason to expect the type of problems that struck the area last month. 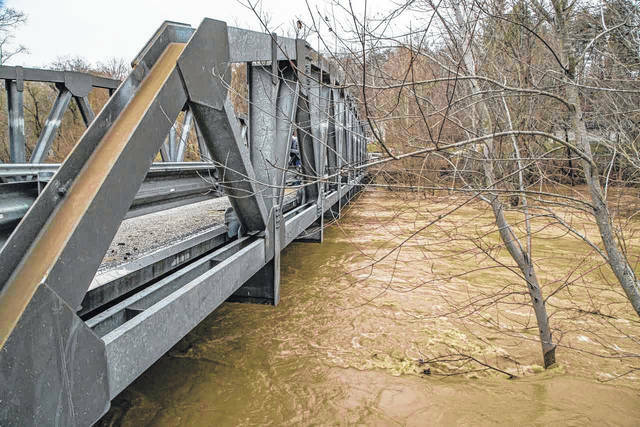 As most know, saying they were erring on the side of caution, Portsmouth officials had the city’s flood gates put in place for the first time in more than two decades. Earlier this week, Gov. John Kasich asked President Trump for a Major Disaster Declaration so local governments stuck with infrastructure and flood defense costs might see some financial relief. Scioto County alone is looking for help with $4.1 million in flood related costs. Statewide, the wet weather is said to have cost more than $44 million. Kim Carver, Scioto County Emergency Management Assistance director, said she is optimistic the federal government will grant Kasich’s request, as the various levels of government involved all reached the minimum financial thresholds, in terms of dollars spent connected with the flooding, needed for federal help. Carver said the answer should come from the feds in two to three weeks. https://www.portsmouth-dailytimes.com/wp-content/uploads/sites/28/2018/03/web1_Rain-1.jpgAccording to the National Weather Service, “the Ohio River is going to rise considerably” due to this week’s rains, but is not expected to exceed flood stage as it did in February.